An unbelievable advantage for Credit Union Members! WCU is a member of the Credit Union Service Center Program. What does this mean for you? It means that you have access to your account worldwide. Not just through our International Debit Cards, but you can do business at thousands of credit unions worldwide, just as if you were in our main office. We are everywhere you need to be. 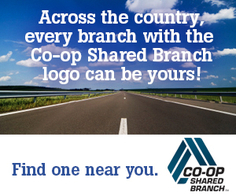 CO-OP Shared Branching gives you nearly 5,000 branches and over 2,000 self-service locations in all 50 states, Puerto Rico, Guam and military bases around the globe. Plus our member service center* is available 24/7 via our toll-free number 888-837-6500. You are never far from your money when you need it. Convenience is KEY in your busy life and we’ve got you covered. Many branch locations provide extended weekday and weekend hours. Our self-service locations are open 24/7 and can be found at participating 7-Eleven stores. Plus, our member service center* can help you out 24/7 as well. We’re there to help you access your credit union accounts whenever you need to. Whether face-to-face, over the phone, or self-service, our full-service locations and toll-free member service center* have you covered as an extension of your credit union. Simply have your credit union name, account number, and government ID and you’ll have access to your accounts. *Available to participating credit unions only. Click here to find out if your credit union participates. Your son attends a baseball game with a friend in Boston and loses his wallet. You can deposit cash into our Main office in Decatur, AL, and we can give him directions to a shared branch in Boston that he can walk into and withdraw the funds right then. Now that’s peace of mind! Your daughter takes her first visit to a college campus with a group of her girlfriends. She forgets all those safety lessons you’ve taught her and leaves her purse unattended in her car. She calls you for help but you have taken a vacation to the mountains to forget about how grown up your baby girl is. You can go to the nearest shared branch and deposit cash, and we can give her directions to the shared branch nearest her, and just like that, she has cash! Now that’s peace of mind!